One of the most popular landscape palms, the stout form of the Canary Island Date Palm is a familiar sight in most warm temperate and subtropical countries of the world. 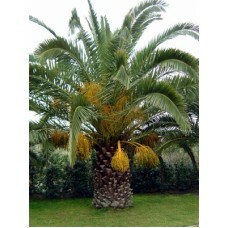 The Canary Island Date Palm is impressive both for it's far reaching fronds and the thick trunk. 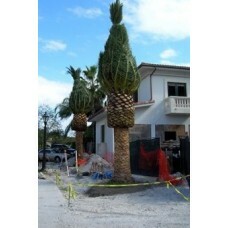 When trimmed professionally, the Pineapple Palm will indeed look like a pineapple on top. 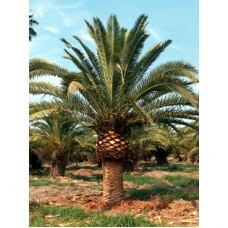 The Canary Island Date Palm is cold hardy and rated for Zone 9. The Canary can tolerate frost and temperatures into the low 20's. 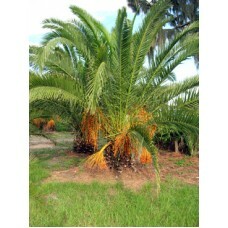 One of the most popular landscape palms, the stout form of the Canary Island Date Palm is a familiar..